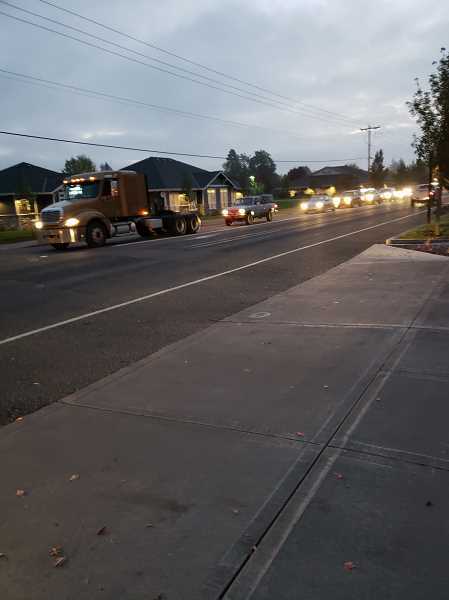 It's been at least three years since the City Council has been working with Oregon's Department of Transportation to get a pedestrian crosswalk put in at Highway 211 and Hezzie Lane. Even last year after a middle school student was hit crossing the street, ODOT still told the council it was a couple of years off. All that has now changed. ODOT's Region 1 Manager Rian Windsheimer called Mayor Jimmy Thompson on Nov. 16 to tell him that the state's Transportation agency will install a flashing beacon when they get the equipment in six to eight weeks. Striping will follow installation when weather permits. "I've been talking to ODOT all this time asking for pedestrian improvements," said Thompson. "Last year when a student was hit there [at Hezzie and 211] even though it wasn't as serious as it could have been, it opened a line of communication and gave the city more leverage." Actually, the city has been trying to get a pedestrian crossing at the intersection since 2012, Thompson said. It was approved in 2015-16 to be funded in 2020 as part of the STIP project for Highway 211 sidewalks and other improvements, he added. However, Thompson noted that he didn't deserve all the credit that City Manager Dan Huff and Public Works Director Gerald Fisher worked hard to get it put in it too. They also asked the Molalla River School District to write letters to ODOT, and collected 30 letters from them. Once that happened along with constant calls as to "pester" ODOT and Fisher's safe route to school letter helped make the push to complete the project as soon as possible and accelerated the timeline for the crosswalk. At first the flashing beacon likely will be solar-powered along with signage, Thompson said. Once the remaining part of the STIP infrastructure program is added it will be powered through electricity. Molalla River Schools' Superintendent Tony Mann expressed pleasure regarding the acceleration of the cross walk. "Any time we can improve the community's safety, it's a good thing. I'm really grateful for the city's leadership and Mayor Thompson's work of pressing ODOT to make our citizens and children a top priority," Mann said.